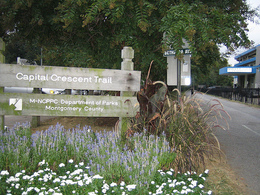 · restored some of the funding to the Silver Spring Green Trail. The delay was reduced from 3 years to 1. The final budget includes $200K to regrade and resurface the badly eroded section of the Interim CCT east of Rock Creek, and to perform a thorough study of what is needed to correct the storm water drain system in that area. DPWT Director Arthur Holmes promised the Council Transportation and Environment (T&E) Committee that the trail repair work would begin at the start of the next fiscal year, in July 2006. MacArthur Blvd. would be widened, where possible, to 26 feet to provide for two 10-foot-wide lanes for cars and one three-foot-wide lane for bicyclists on each side of MacArthur. Also where possible, green space of at least five feet would run along the boulevard. Next to it would be an eight-feet-wide shared path for pedestrians and bicyclists. The new bikeway would, according to the DPWT, "provide spot improvements to address deficiencies and immediate safety concerns on MacArthur Blvd." These would include adding lighting under the Beltway overpass at MacArthur, changing the existing parking area at the Union Arch Bridge and in front of the Captain's Market at Tomlinson Ave. Access to the Clara Barton Parkway at Ericsson Road would be altered. Finally there were a couple of reports (and here) this week about a study, being compiled by the Metropolitan Washington Council of Government’s Transportation Planning Board, that shows there are more than 350 projects directly aimed at pedestrians and bicyclists currently working their way through individual jurisdictions. "The more bicyclists there are in a place, the safer it is to bicycle -- the more motorists expect to see cyclists, the more that becomes part of the norm," said Farrell. Planners for the national capital region have a $500 million plan to make pedestrian and cycling safety a top priority. The plan calls for 680 new miles of paths, including one that would put a bike and jogging path on the new span of the Woodrow Wilson Bridge. So it's not all doom and gloom. And if you believe, as Benicio Del Toro said in "Way of the Gun" , that "a plan is just a list of things that will never happen." Take joy in actually completed projects. I noticed that East Capitol Street bike lanes between 1st and 2nd street opened (and the road opened too) and that the bike lanes around Thomas Circle NW are open as well (though one bike lane is only 10 feet long - photo to follow). stopped filling their emails with my rants when I was informed that there was going to be "a study"
(the bikes would remain in the "door zone"
qwadzilla, what street are you referring to? I presume you're suggesting bike lanes, not a bike path. You're right and the line is, "A plan is just a list of things that don't happen."